LUCENA CITY – The Regional Trial Court Br. 53 here finally issued an arrest warrant following the filing of double murder case against 3 policemen accused on the alleged killing of a Quezon mayor’s son and his companion. National Bureau of Investigation (NBI)- Quezon chief Dominador Villlanueva said the order was issued at around 1:00 p.m. by Judge Dennis Orendain of Lucena City Regional Trial Court, Branch 53. “At last, a warrant which we have been waiting for, was finally issued,” said Villanueva over the phone. Villanueva said the case against former Tayabas City police station commander Supt. Mark Joseph Laygo and his men PO1 Robert Legazpi and PO2 Lonald Sumalpong was raffled on April 1 but the presiding judge was on official travel. 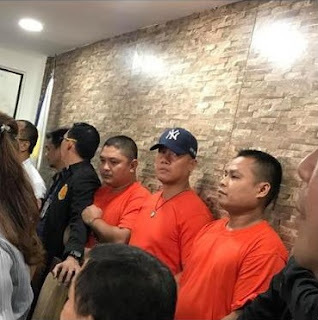 With the issued order, Villanueva said the NBI will take custody of the 3 policemen who are presently detained at the compound of 1st Quezon Provincial Mobile Force Company at Camp Dolor in Candelaria, Quezon. The trio along with 14 other former Tayabas police personnel have been under restrictive custody on orders of Calabarzon police durector, Chief Supt. Edward Carranza. Villanueva said they will coordinate with Quezon police director, Senior Supt Ramil Montilla before they serve the arrest order for the trio. “We will serve the order today and bring them to NBI main office,” Villanueva said. Laygo, Legazpi and Sumalpong are the main suspects in the killing of Christian Gayeta, 21 and Christian Manalo, 38, son and most trusted aide, respectively, of Sariaya Mayor Marcelo Gayeta on the night of March13 in Tayabas City. The 3 policemen flatly denied the charges.